Peer pressure is still a thing as adults. If anything, I think it’s just as prevalent and we’re less adept at recognizing it than we were as teenagers. When we were teenagers EVERYONE was warning us not to give in to peer pressure, but now, it’s just keeping up with our friends. I need to tell you, in order to obey God, I have to preach to myself all the time that it’s okay to go against the grain. It’s okay to be misunderstood by others to be approved of by God. When I was a new Christian as a young teenager, this was easy for me to understand. In order to obey God, I couldn’t hang out with my friends that did bad-kid stuff. It didn’t matter to me at that point if they didn’t think I was cool or acceptable. BUT, what does it look like when our friends are Jesus-y but their lives look differently than ours? We can’t just dismiss their way of life out of hand as bad…but it is sometimes difficult to live in the tension that you’re both following Jesus and you’re coming up with different convictions and different ways to do so. In the past few years, we found ourselves following Jesus in what I might call “downward financial mobility”. :) As the years past, we found ourselves making less and surviving on less and less. As friends drove nicer cares and bought nicer houses and racked up their investments, we were stacking pennies and holding our breath until our next check came in. It wasn’t that we thought poverty was the way to follow Jesus, but low-level poverty is where we found ourselves as we did follow Jesus in more and growing intimacy. This is not to say money is bad. We’re not in the same financial position we were. BUT, I learned how hard it is to follow Jesus differently than others in your friend group or your church family during that time. Pride - just because you have been convicted differently does not make you holier or more right. They are likely growing closer to the Lord in ways that are still far from Him. Believe well of your friends and church family. Be generous and gracious with your assumptions. Shame - more recently, I’ve become tempted to believe that I’m wrong and EVERYONE ELSE is right. I’ve felt misunderstood and maligned, and I think I might be making 80% of it up in my head. That’s what shame does. Shame inflates and inflames our worst beliefs about ourselves—and not in a holy way, at all. 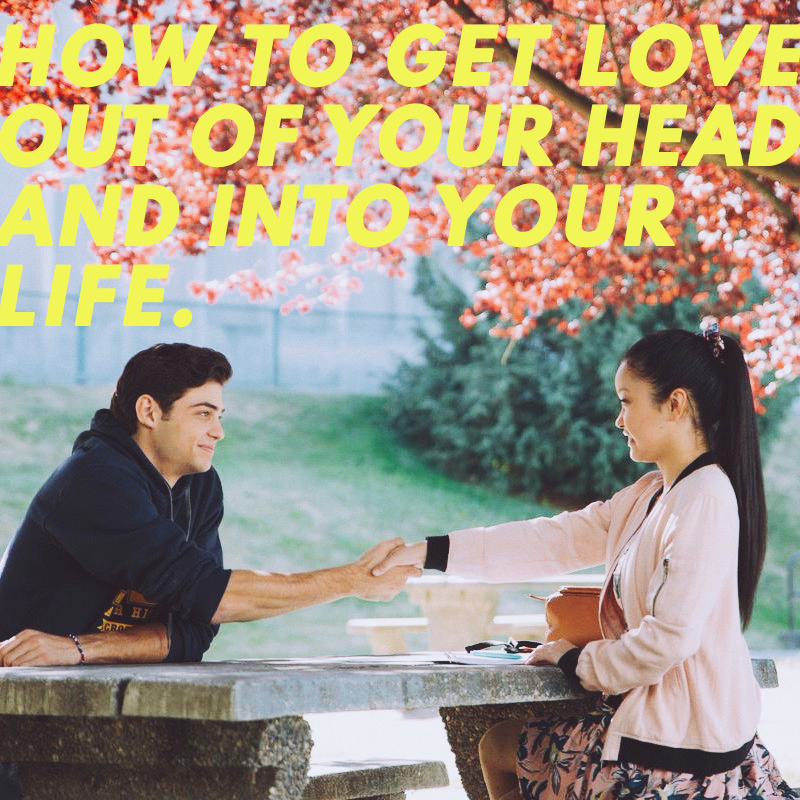 Like the rest of Americans with Netflix, I spent much of last month enamored with the adolescent love story between Lara Jean Covey and Peter Kavinsky. Don’t know who I’m talking about? Hang with me here for a second. I’m about to dive into a b-level Netflix rom-com and tie it all to the Lord…how’s that for some gymnastics? We’ve been denied classic rom-coms by Hollywood for years (another take!). The thing is, most everyone LOVES a good rom-com. We’re not looking for an Oscar worthy performance, we’re not looking for a totally un-problematic plot, we’re looking for a likable couple and a moment of escape from the ever-worsening news cycle. And, now we have it with To All the Boys I’ve Loved Before. Quick catch-up (no spoilers): Lara Jean Covey is a darling high school girl who doesn’t know how cool she really is (classic rom-com move). Peter Kavinsky is the sporty guy who is really into the actually cool girl (Lara Jean)…not the supposed-to-be cool girl (his ex-girlfriend Gen). Pretty simple and predictable narrative. Lara Jean’s Achilles Heel is that she’s always getting stuck up in her own head. She loved to think about love. So much so that she was afraid of actually experiencing love. She has a series of great romances in her head, but she never gets the courage to actually pursue them…so they stay safe and contained in her mind. She’s a little naive and a little stunted because of all the relating and romancing she’s idealizing in her mind and not out in real life. I’m not here to make a statement about teen dating, BUT, to make a statement that I believe we do the same in our faith. I think we idealize ourselves and our version of following Jesus when we keep our faith all up in our heads and don’t let it move down to our heart. In order to really live our faith and understand a “relationship with Jesus”, we have to get out of our own heads. We can’t simply think about God. We have to go BE with God. When we just let it swirl in our minds, we get in our own way and become stunted and naive. We end up being low-level hypocrites because we think a lot about high-minded and lofty things, but don’t let it shift our actual life. That’s where the understanding comes. The understanding, the relating comes when we take what we know and then let it inform our actions, behaviors, and whole lives. This takes some intense courage and often times we have to talk ourselves into it. We have to tell ourselves that it’s worth it, and that what Jesus said is actually good. We have to tell ourselves that we should believe and act upon what we know. I wonder if we’re afraid of the great power that might exist if we dared step into the life God talks about in His word. Living confidently, laughing at the days to come, believing we’ll be provided for, and providing for others. Knowing others and being known. Telling others about this great hope and source of strength we’ve found. What if we didn’t just think about this great love, but we actually let ourselves trust in it, let ourselves fall deeply into the consequences of it? Would we discover, like Lara Jean did in a silly rom-com that living in the reality of love is really so much better than thinking about it? I hate this one thing about myself. I struggle SO MUCH against comparing myself with other women. I’ve done a lot of work with the Lord to figure out the ins-and-outs of this annoying trait. I’ve noticed that it is not an envy thing, it’s not that I want what she has. It is more like, I cannot know where I stand unless I know where I stand against someone else. Like, what is my identity if I don’t have someone else as a measuring stick. And, that’s super gross, right? It’s also unhealthy, wrong, and disobedient to the Lord’s best for me. It drives me actually bonkers and makes my mind extremely chatty in all the worst ways. Maybe you can relate? I think social media makes this worse, but I’m also 100% certain I’d figure out a way to still compare myself even if I didn’t have such an intimate glimpse into so many women’s lives. This is not a modern problem. This is a human problem. And, because our brains are wired as they are (Preach to Yourself has a whole dedicated chapter to our brains! ), the more we compare, the more often we’ll find ourselves comparing. It’s a self-fulfilling prophecy. I want to give you a few mantras I use to act as antidotes to the bad news I tell yourself (which is that I just don’t measure up). And, then there are a couple quotes I love so much that I keep in mind to combat the energy-sucking bad news that I’ll never measure up. The bad news is, as humans we’re prone to comparison. We hear the drumbeat of other’s lives, achievements, looks, praises, and on and on. But, here’s the good news…we can keep our eyes on our own paper and begin to hear more and more about God’s love for us.